Is Marvell Technology Group Ltd. (NASDAQ:MRVL) a good bet right now? We like to analyze hedge fund sentiment before doing days of in-depth research. We do so because hedge funds and other elite investors have numerous Ivy League graduates, expert network advisers, and supply chain tipsters working or consulting for them. There is not a shortage of news stories covering failed hedge fund investments and it is a fact that hedge funds’ picks don’t beat the market 100% of the time, but their consensus picks have historically done very well and have outperformed the market after adjusting for risk. Marvell Technology Group Ltd. (NASDAQ:MRVL) has seen an increase in activity from the world’s largest hedge funds in recent months. 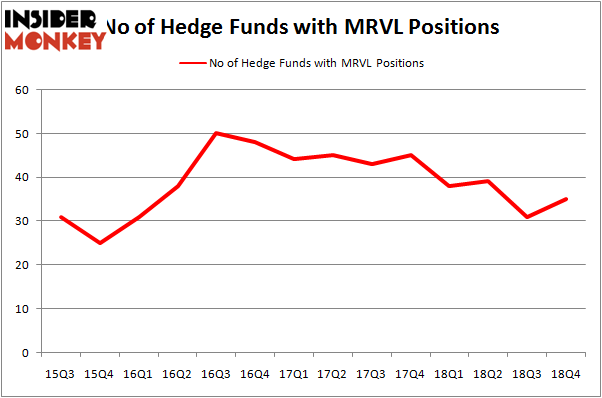 Our calculations also showed that MRVL isn’t among the 30 most popular stocks among hedge funds. We’re going to go over the latest hedge fund action encompassing Marvell Technology Group Ltd. (NASDAQ:MRVL). What does the smart money think about Marvell Technology Group Ltd. (NASDAQ:MRVL)? At the end of the fourth quarter, a total of 35 of the hedge funds tracked by Insider Monkey held long positions in this stock, a change of 13% from the previous quarter. Below, you can check out the change in hedge fund sentiment towards MRVL over the last 14 quarters. So, let’s review which hedge funds were among the top holders of the stock and which hedge funds were making big moves. More specifically, Starboard Value LP was the largest shareholder of Marvell Technology Group Ltd. (NASDAQ:MRVL), with a stake worth $580.9 million reported as of the end of September. Trailing Starboard Value LP was Citadel Investment Group, which amassed a stake valued at $367.1 million. Alyeska Investment Group, Holocene Advisors, and Roystone Capital Partners were also very fond of the stock, giving the stock large weights in their portfolios. As industrywide interest jumped, specific money managers were leading the bulls’ herd. Park West Asset Management, managed by Peter S. Park, created the biggest position in Marvell Technology Group Ltd. (NASDAQ:MRVL). Park West Asset Management had $27.5 million invested in the company at the end of the quarter. Jim Simons’s Renaissance Technologies also made a $4.1 million investment in the stock during the quarter. The following funds were also among the new MRVL investors: Marc Majzner’s Clearline Capital, Steven Baughman’s Divisar Capital, and D. E. Shaw’s D E Shaw. Let’s now review hedge fund activity in other stocks similar to Marvell Technology Group Ltd. (NASDAQ:MRVL). These stocks are The J.M. Smucker Company (NYSE:SJM), Devon Energy Corp (NYSE:DVN), TransUnion (NYSE:TRU), and W.P. Carey Inc. (NYSE:WPC). This group of stocks’ market caps are similar to MRVL’s market cap. As you can see these stocks had an average of 25 hedge funds with bullish positions and the average amount invested in these stocks was $716 million. That figure was $1329 million in MRVL’s case. Devon Energy Corp (NYSE:DVN) is the most popular stock in this table. On the other hand W.P. Carey Inc. (NYSE:WPC) is the least popular one with only 10 bullish hedge fund positions. Marvell Technology Group Ltd. (NASDAQ:MRVL) is not the most popular stock in this group but hedge fund interest is still above average. Our calculations showed that top 15 most popular stocks among hedge funds returned 19.7% through March 15th and outperformed the S&P 500 ETF (SPY) by 6.6 percentage points. Hedge funds were also right about betting on MRVL as the stock returned 24.4% and outperformed the market as well. 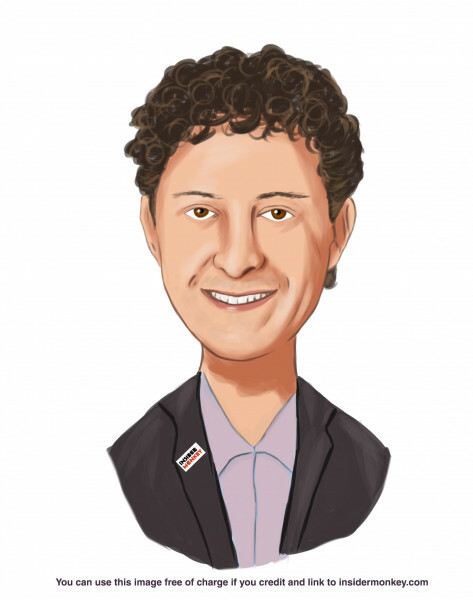 Here is What Hedge Funds Think About Flocking Into ZTO Express (ZTO) Here’s What Hedge Funds Think About Principal Financial Group Inc (PFG... Is CNH Industrial NV (CNHI) A Good Stock To Buy? Is Liberty Broadband Corp (LBRDA) A Good Stock To Buy? Activist Keith Meister Says This Year’s Market Rally and Last December’... Is Vulcan Materials Company (VMC) A Bargain According To Hedge Funds?